Well, I woke up to an uninvited guest in the kitchen this morning. That's right - somehow this scorpion found his way into our sink. Where did he come from and how did he get there? I sure would like to know! And he's not the first. I found a teeny, tiny one on my bathroom counter a few weeks ago. And another on the wall a few years ago. 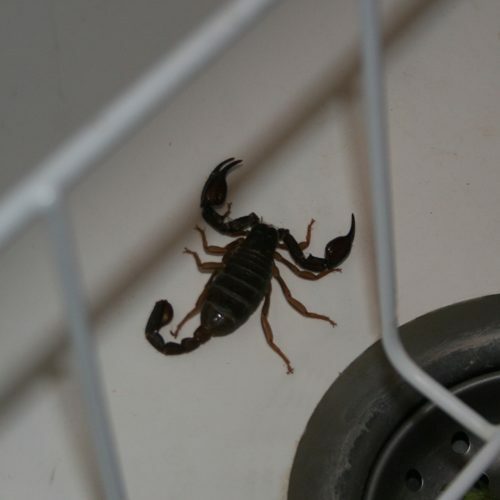 And even had one in my pant leg several years back (they sting, btw - good thing I'm not allergic). Hmm. You'd think I live in the wilderness or something. Oh yeah, that's right - I do! A few days ago, my eight year old daughter and I were talking about these. This weekend, I'll have to let her check out your story. :) She was wondering if they ever managed to come into peoples houses? I replied, insects find their way into our house, right? So why not a scorpion. Here in Maryland, it's stinkbug season. I found them throughout the house. I guess they're seeking shelter for the cooler months. Thanks for stopping by, Opal. Yes, unfortunately they do get in sometimes. If I could figure out how, I'd put a stop to it - no telling how many I don't see! DIY Hair Donation - Who Knew? Debit or Credit - Which Card Should You Use?